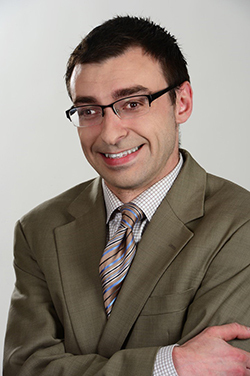 After having spent time covering a variety of sports, Chicago native Jason Benetti ’05 will begin the 2016 Major League Baseball season covering his hometown team, the Chicago White Sox. A 2005 graduate of the Newhouse School and the ­College of Arts and Sciences, Benetti was born with a mild form of cerebral palsy, but that did not prevent him from actively participating in campus life when he was a student. Benetti covered lacrosse and women’s basketball games at SU. After graduation, he worked for the Syracuse Chiefs before joining ESPN in 2011. He has called college baseball, football, lacrosse and basketball—including Syracuse University men’s basketball. Q. You’re the new television play-by-play announcer for the Chicago White Sox. There must be a lot of excitement behind that. How did the opportunity arise? I called the Sox in October and showed interest in the job. They called me back a few hours later and told me they had some interest in speaking to me. I planned to be in Chicago soon thereafter for a 50th anniversary celebration for my high school radio station and so the Sox, their rights-holders and I met. Q. How did your experiences at Newhouse help you develop your career? Well, I met some truly wonderful people, both friends and professors. My college roommates remain some of my best friends in the entire world. In no particular order, professors Frank Currier, John Nicholson, Bob Lissit, David Rubin and Chris Tuohey were tremendous guides and friends when I was a student (and are still friends now). I learned at Newhouse and through student media both what to do and what not to do, by watching and doing. I think the most memorable thing I take from my time at Newhouse is how wonderful it is to be surrounded by people who have a zeal for creativity, sports and broadcasting. Being in that environment is simply energizing to the soul. Q. What has been the biggest obstacle for you in pursuing your career? I think perception, whether it be my own or the perception of others. It’s easy for a person with a disability to believe that people are making snap judgments about his or her appearance or intellect. Sometimes that belief is accurate. Other times that belief is terribly destructive and only serves to shift focus negatively. It took a long time for me to understand how people view my disability. And that viewpoint still changes depending on the situation I’m in. Q. How is covering play-by-play for baseball different from covering other sports, like football and basketball? Baseball allows announcers and fans to daydream more than the other sports. When I say “daydream” I don’t mean “zone out.” Baseball facilitates mental connections. “Hey, remember that time …” is something I say quite often when I’m thinking about baseball, and when I’m talking to players, managers and coaches about the game. There’s such a thorough history to the game. It’s full of memories. Q. What was your most memorable moment as a Syracuse University student? It’s really tough to pick one. I could give you a lot of inside jokes. One time, on a WAER road trip, a few friends and I were chased off a miniature golf course by a crazy owner named Jeremy (or so we think). Another time, I was late with a couple friends to Bob Thompson’s class (still my favorite Newhouse class) and Bob and I may or may not have raised our voices at each other just outside the classroom for the rest of the class to hear. My most memorable moment changes depending on when I think about my time at SU, and that is truly glorious.